Wireless microphones: Sony ECM-310BMP headsets and a Sony ECM-77BMP lapel mic feeding into Sony WRT-805A body pack transmitters. Wireless receiver: Sony MB-806A modular base unit containing five Sony WRU-806A/64 UHF synthesized tuner modules. Analog-to-digital converters: Two Sonorus AUDI/O AD/24 8 channel 24 bit 44/48kHz optical-output converters, connected to a Sonorus STUDI/O 16 channel digital audio PCI bus interface, mounted in a Dell 500 MHz Pentium III PC running Red Hat Linux 6.1. Ambient mics: Four Crown PZM-6D pressure zone microphones. Home-made dummy PDA with two cheap electret elements mounted about 8cm apart. 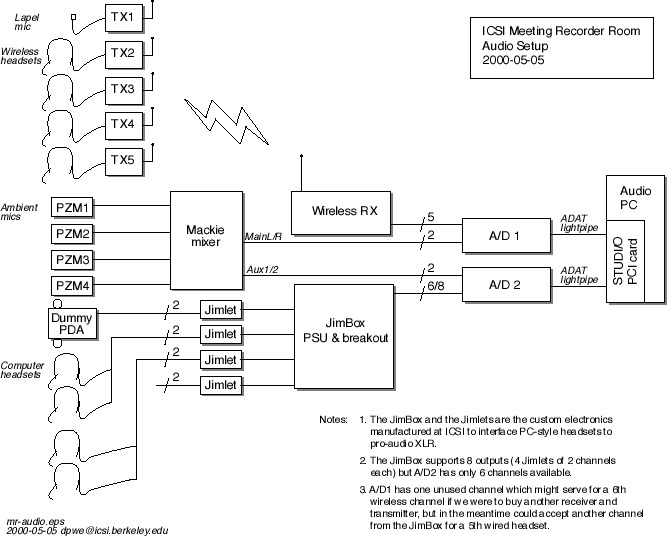 In-house-manufactured bias power/amplifier/line driver to interface conventional computer headsets with pro-audio XLR inputs.